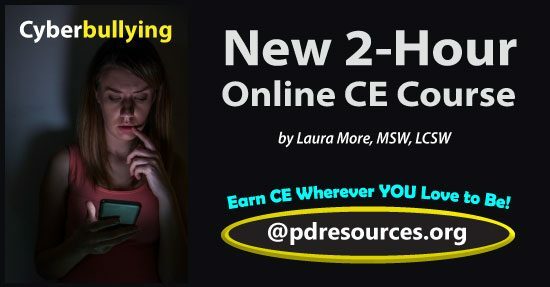 Cyberbullying is a new 2-hour online continuing education (CE/CEU) course that reviews evidenced-based research for identification, management and prevention of cyberbullying in children, adolescents, and adults. Bullies have moved from the playground and workplace to the online world, where anonymity can facilitate bullying behavior. Cyberbullying is intentional, repeated harm to another person using communication technology. It is not accidental or random. It is targeted to a person with less perceived power. This may be someone younger, weaker, or less knowledgeable about technology. Any communication device may be used to harass or intimidate a victim, such as a cell phone, tablet, or computer. Any communication platform may host cyberbullying: social media sites (Facebook, Twitter), applications (Snapchat, AIM), websites (forums or blogs), and any place where one person can communicate with – or at – another person electronically. The short and long-term effects of bullying are considered as significant as neglect or maltreatment as a type of child abuse. Cyberbullying is on online course and provides instant access to the course materials (PDF download) and CE test. After enrolling, click on My Account and scroll down to My Active Courses. From here you’ll see links to download/print the course materials and take the CE test (you can print the test to mark your answers on it while reading the course document). Professional Development Resources is approved to sponsor continuing education by the American Psychological Association (APA); the National Board of Certified Counselors (NBCC ACEP #5590); the Association of Social Work Boards (ASWB Provider #1046, ACE Program); the American Occupational Therapy Association (AOTA Provider #3159); the American Speech-Language-Hearing Association (ASHAProvider #AAUM); the Commission on Dietetic Registration (CDR Provider #PR001); the Alabama State Board of Occupational Therapy; the Florida Boards of Social Work, Mental Health Counseling and Marriage and Family Therapy (#BAP346), Psychology & School Psychology (#50-1635), Dietetics & Nutrition (#50-1635), Speech-Language Pathology and Audiology, and Occupational Therapy Practice (#34); the Georgia State Board of Occupational Therapy; the New York State Education Department’s State Board for Mental Health Practitioners as an approved provider of continuing education for licensed mental health counselors (#MHC-0135); the Ohio Counselor, Social Worker & MFT Board (#RCST100501) and the Board of Speech-Language Pathology and Audiology; the South Carolina Board of Professional Counselors & MFTs (#193); the TexasBoard of Examiners of Marriage & Family Therapists (#114) and State Board of Social Worker Examiners (#5678); and is CE Broker compliant (all courses are reported within a few days of completion). This entry was posted in CE Courses, Counseling CE, Marriage & Family Therapy CE, Mental Health, Occupational Therapy CEUs, Psychology CE, School Psychology CE, Social Work CE, Speech-Language Pathology CEUs, Teaching CE and tagged @pdresources.org, bullies, Bullying, CE, continuing education, Cyberbullying, online bully, Professional Development Resources, technology by Gina Gunderson. Bookmark the permalink.